Reiki is an important part of my books, as well as my life. I am a Reiki Master Teacher, and the practice has enhanced my life in innumerable ways. For those of you who aren’t familiar with this healing modality, I wanted to share a little information about it. I practice Reiki primarily for pets, so this is written about animals. 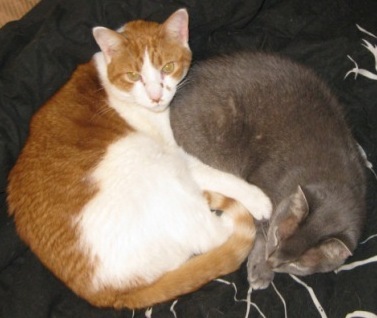 Two of my cats, Sundance and Eduardo, demonstrate how cats make the perfect Yin and Yang. Reiki is a form of therapy with the goal of improving the flow of energy in a person or animal. Reiki (pronounced ray-key) means “universal life energy” in Japanese, and Reiki practitioners are trained to detect and alleviate problems of energy flow on the physical, emotional, and spiritual level. It is safe and gentle and has been used in hospitals in the U.S. and around the world. All living beings have energy, commonly called chi or ki. Traditional eastern medicine has identified several main energy centers of the body. By measuring and balancing these energy centers, the reiki practitioner can bring more harmony and peace to your pet’s body. Once the session begins, your pet may walk around, vocalize, yawn, stretch or even fall asleep. These are all typical releases as your pet relaxes and receives the reiki energy. Each animal is different and each session is different. Reiki is not limited by proximity. Because reiki is universal energy, it can flow anywhere. Level II and master reiki practitioners have been trained to connect with others all over the world. Distance reiki can be beneficial when it is not practical to for a practitioner to meet in person or be close enough to lay hands on, for instance if a client is traveling, moves, or is in surgery. In addition, animals that have been abused or have fear or aggression issues may respond better to distance reiki initially until they establish a deep level of trust with the reiki practitioner.